Many parents who homeschool children with special educational needs jump into homeschooling without much preparation. 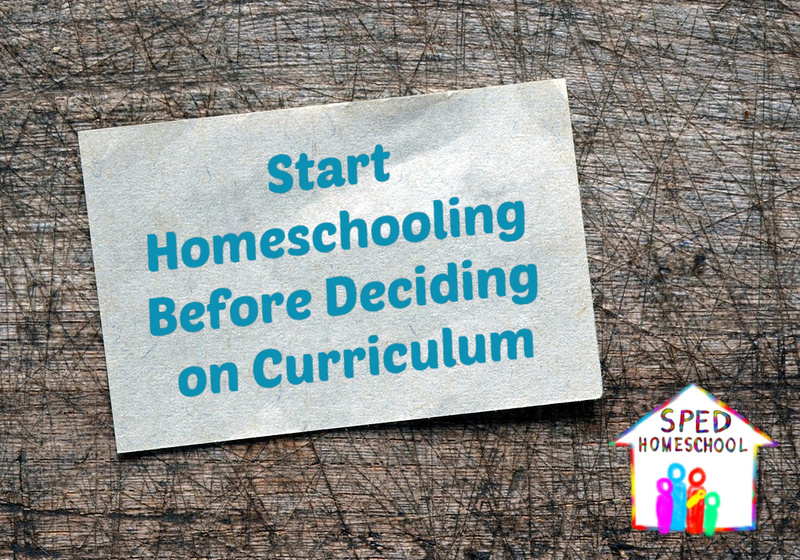 Unfortunately many times school situations, health conditions, or other factors must be given precedence over deciding on curriculum and preparing everything needed to start homeschooling like many well-meaning bloggers suggest. I was one of those parents. We dove into homeschooling without much preparation because my oldest was sinking into a deep depression in kindergarten with yet a few months left before the end of the school year. I had to figure out what to do right away, and so I quickly decided I would use those months before summer as a testing ground to see what teaching techniques worked best for my son and his younger brother, as well as myself. Nowadays we would term what I did as “deschooling,” but I found it was an instinctual route I took that not only allowed me to understand how to chart our homeschooling course moving forward, but also regroup as a family so we could deal with my son’s depression and help him move out of that place of despair. Considering this was 17 years ago, there weren’t a lot of homeschool curriculum options, but what I could find I narrowed down into three categories. The first category was a classical/literature approach, the second was a textbook approach, and the third was a unit study approach. I then decided in order to make it a fair experiment, I needed to eliminate bias and other factors that may sway the results (yes, that is my inner physicist coming out), so we stuck to a specific theme and time period as we tried out these three approaches.Pirates and seafaring around the time of the 16th and 17th centuries was what I finally settled on. Over the next few months we read historical fiction, had discussions, acted out what we were studying, did workbook pages, read textbooks excerpts, built structures, created costumes, watched movies, went on field trips, and even tried out some recipes and learned how to tie quite a few different types of knots. And, it was the knot tying exercise that sealed my choice on how were were going to proceed in our homeschooling the following year—and eventually all the way through my oldest son’s graduation. The day we were learning to tie knots I noticed how my children didn’t mind listening to the book and looking at the examples of how to tie the knots as they were explained one by one (a textbook approach). I also noticed that my kids found it interesting when they were given rope and allowed to tie the knots that the book walked them through (a more classical approach). But when I gave them 20 feet of rope and told them they were allowed to tie me up as long as they used proper knots (unit study approach), their energy and enthusiasm for the task escalated by 10-fold. Thus, we started our homeschooling using unit studies the following year. I am so grateful I look the time to explore our options with my children before deciding on curriculum. No matter what other things we had to tweak in our instruction to help my children overcome other learning obstacles, we always had a base curriculum that worked for all of us. What about you? How did you decide on the curriculum you are now using in your homeschool? Share with us on our social media sites. Haven’t decided on a curriculum yet? Check out our articles and broadcasts this month that are focused on helping you make the best choice for your student and your homeschool. Every child is unique, but here are some simple steps to shopping for homeschool curriculum. A short description of the presentation could go here. Using innovative technology for customizing home education materials, instructional pace, and record keeping. Interview with Judi Munday, Special Needs Educational Consultant and author of Teaching a Child with Special Needs.